One of a pair of paintings, the other being one depicting her end. 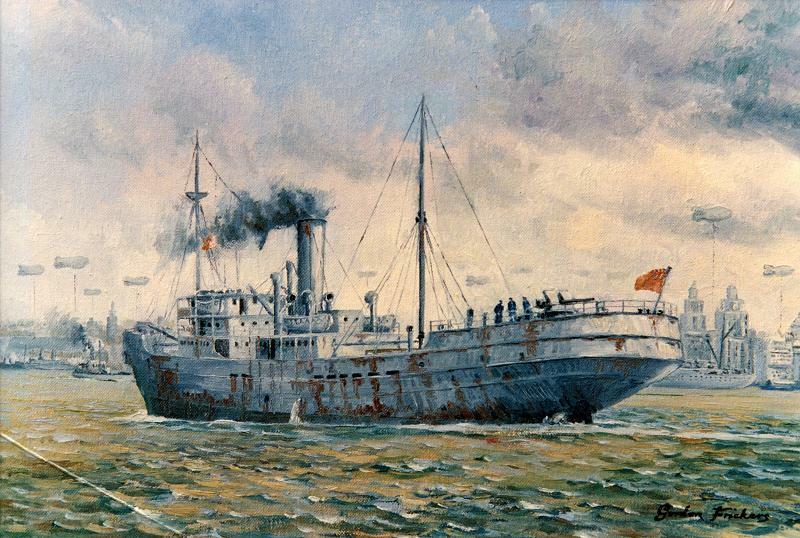 This Holt line ship, built in Liverpool was a typical tramp steamer of her day working mostly the West African coast. 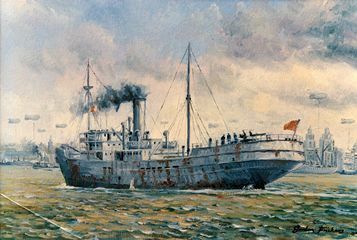 She was the last British ship with troops and refugees out of Dieppe before the Germans over ran the region. As such she is the subject of a book called The Last Bus Home, written by a soldier who was forever grateful to her and her people. She was eventually sunk of Africa by U 69, at night after a fierce gun battle. The commander of U 69 reported he had sunk an Armed Merchant Cruiser and was given an Iron Cross. In reality she was just a tramp steamer with one old WW1 gun and a very gallant crew. There were no survivors.